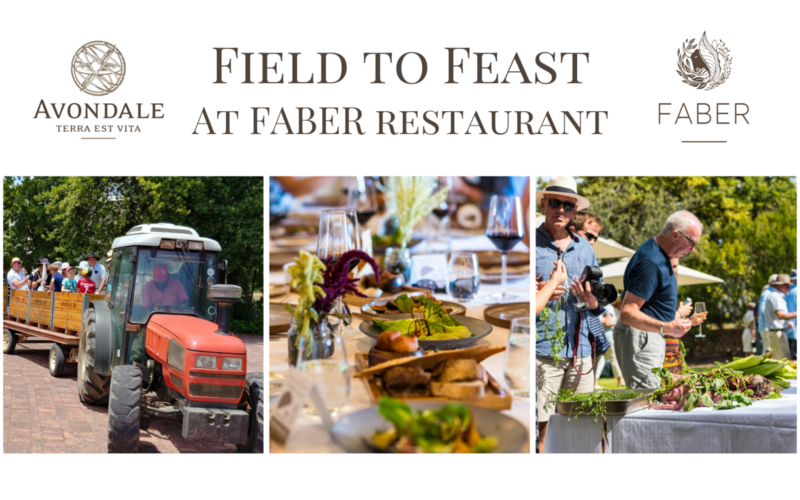 The Field to Feast, three-course luncheons paired with Avondale wines are co-hosted by Avondale proprietor and entertaining raconteur, Johnathan Grieve and FABER Chef, Dale Stevens. Each event is a unique experience of the Avondale Estate with a journey through the vineyards and food garden where guests are regaled with the stories of how the food is produced and the wines are made in harmony with Nature. Seats for each ‘Field to Feast’ are limited, and advance reservations are highly recommended. A deposit of R100 per person is required to secure the booking. *Water, coffees and any other extras not included. *A discretionary 10% gratuity will be added to your final bill. Sourdough, butter, fynbos honey, jalapeno and mint cream cheese, pumpkin fritters. Salt and sugar cured Saldanha trout, beetroot and fennel. Fried Avondale hens egg, creamed leek and Black Forest ham. Gorgonzola dressed lettuce, apple, kohlrabi and crispy onions. Confit and seared duck, wilted greens, apple and rhubarb. Buttered Nicola and red potatoes, parsley and parmesan. Roasted carrots and crème fraiche. Baked polenta, white chocolate and granadilla. via email faber@avondalewine.co.za or phone 021 202 1219.
massa sem, nunc pulvinar risus. lectus elementum elit.